I have another Dance Legend Polish to show you tonight and it's such a stunner for such a simple glitter. The Dance Legend Flossy line consist of various combinations of matte glitters. This one is matte hexes in pink, green, blue and red in a clear base. It's such a simple glitter but I'm so in love with the look it creates. This is two coats of Flossy #180 layered over Cult Nail Time Traveler. 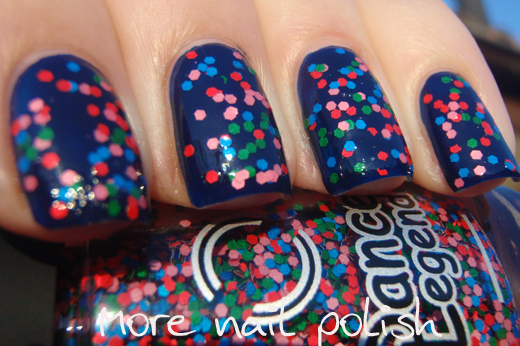 Again, this is another polish that I can't find on the English version of the Dance Legend website, but I did find them on the Russian version here. There are 14 flossy polishes created with hex glitters and another collection of Flossy Line which are all fine bar glitters. Beautiful! You chose the perfect base color! I think some other etailers are stocking some Dance Legend polishes now, like Llarowe and Ninja, but I got mine directly from Dance Legend using the site linked above. 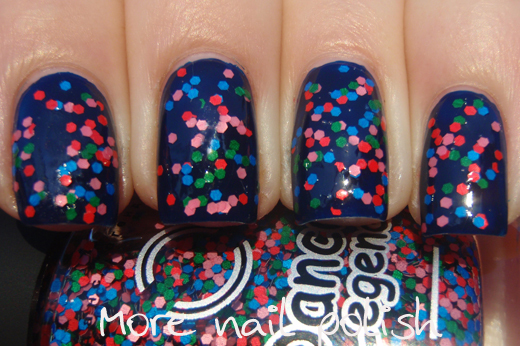 Do you know where we can get a hold of Dance Legend polishes here in Aus? Or a place online that ships here?